a round tire Can't Seal against a flat wall! Secure Gravel Bags fit snug where tires can’t reach and provide an effective seal against bunker walls. Replace tires entirely when used with the Secure Covers System, or use to seal the bunker edge when used with only a bunker cover. Cover your silage easier and with less manpower! 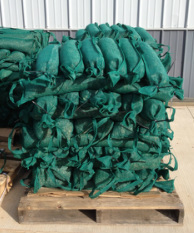 Secure Gravel Bags are made from the same woven polyethylene material as Secure Covers. Designed for easy handling, they are approximately 3' long, and come in two handle styles to suit you. Secure Gravel Bags are easy to stack on a pallet and freely drain water when filled with the recommended 3/4" pea gravel/stone. Filled weight of 30-35 pounds. Interested in purchasing Secure Gravel Bags? Find your local dealer below or purchase online! Handle Styles to Suit your needs! *Double Side Handle Secure Gravel Bags are recommended for any hanging application. "It sure saved a lot of time instead of lugging those tires all around. When it is windy the gravel bags seem to hold the cover down better than the tires did. ﻿My three grandchildren had fun filling up the gravel bags. The green color makes the bunker look nicer and neater!"